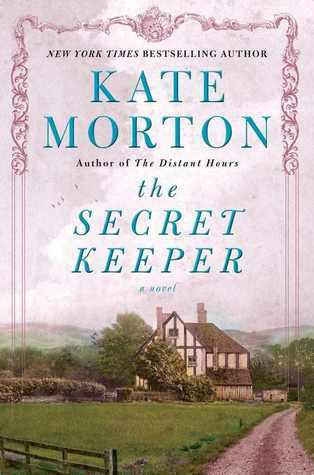 INTRODUCTION: The Secret Keeper is such a stunning novel that it catapulted Kate Morton from the rank of top historical fiction writers of today to my very short list of huge favorite writers period. "During a summer party at the family farm in the English countryside, sixteen-year-old Laurel Nicolson has escaped to her childhood tree house and is happily dreaming of the future. She spies a stranger coming up the long road to the farm and watches as her mother speaks to him. Before the afternoon is over, Laurel will witness a shocking crime. A crime that challenges everything she knows about her family and especially her mother, Dorothy—her vivacious, loving, nearly perfect mother. Dorothy’s story takes the reader from pre–WWII England through the blitz, to the ’60s and beyond. It is the secret history of three strangers from vastly different worlds—Dorothy, Vivien, and Jimmy—who meet by chance in wartime London and whose lives are forever entwined. The Secret Keeper explores longings and dreams and the unexpected consequences they sometimes bring. It is an unforgettable story of lovers and friends, deception and passion that is told—in Morton’s signature style—against a backdrop of events that changed the world." OVERVIEW/ANALYSIS: The setup of The Secret Keeper is similar to the author's earlier novels though this time it acquires an extra layer and while the modern (2011) part is occasionally slower, the 1938-1941 parts are pure spellbinding. In 1961, 16 year old Laurel has an idyllic life with her four younger siblings on her family isolated farm, when a stranger comes there and Laurel sees him greeting her mother Dorothy by name and telling her something in a low voice, while she immediately stabs him to death. Later in the police investigation, Laurel recounts the scene omitting the greeting part and corroborates her mother's story: stranger attacks her, tries to grab baby Gerald who Dorothy was carrying at the time, self defense etc, so the case is closed. Being 1961 and a gentler, politer time, the press does not make a big fuss. Life goes on, the incident is forgotten, her parents continue to have a long and happy marriage until her father's death some ten years previous to the 2011 present. However today, 50 years later, Laurel ennobled grand dame of British cinema is visiting her mother who is close to 90 and slipping in and out of lucidity at her nursing home and she starts remembering the incident vividly while becoming determined to understand it until her mother passes away and it's too late. The killing was clearly tied to her mother's life before she became Dorothy Nicolson in 1945, and actually before she came from London in May 1941 to work as maid in the Nicolson household while never returning to visit London since. Also throughout her long life, Dolly kept a lid on her history beyond the bare facts: left Coventry for London against her parents' wishes in the late 30's, worked as maid to a rich old woman and was involved in the war effort, while her parents and younger brother died in the infamous Coventry bombing of 1940. And from here The Secret Keeper starts moving between the past and the present when Laurel discovers that the intruder was a formerly successful writer, Henry Jenkins, who had started his descent into drinking and obscurity - and some said madness - in 1941 after the death in a London bombing of his wife Vivien. Vivien seemed to have been an acquaintance of Dolly despite the huge social gulf between them as she was quite rich: an Australian orphan with traumatic memories of her own, raised by her English schoolmaster uncle of whom Henry, older by some 20 years than her and from lower class origins, was a protegee. There was something eminently calming about the other woman’s gaze and Dolly managed to block out the noise of a diving plane, the answering ack-ack fire, the horrible thoughts of buildings and people being crushed into pulp. The pair of them huddled together and Dolly listened as Vivien said, ‘Go to the railway station tonight and buy yourself a ticket. You’re to— ’. A bomb landed nearby with a thundering crump and Vivien stiffened before continuing quickly: ‘Get on that train and ride it all the way to the end of the line. Don’t look back. Take the job, move again, live a good life.’"
"Vivien. The name did something strange to Laurel. Her skin went hot and cold, and her heart speeded up so she could feel her pulse beating in her temples. A dizzying series of images flashed across her brain—a glistening blade, her mother’s frightened face, a red ribbon come loose. Old memories, ugly memories, that the unknown woman’s name had somehow un-leashed –‘Vivien,’ she repeated, her voice louder than she in-tended. ‘Who is Vivien?’"
The Secret Keeper, my top novel of 2012 as of now, is just awesome stuff and a book to be read many times for atmosphere, details, hints - even when you know what's what and the novel is as powerful if not more - not to speak of Kate Morton's narrative pull that makes one compulsively turn the pages. Your #1 book huh, Liviu? Man, It must be good! I want to read this. Right on, Liviu. Its just cool to see you praise a good book. I have to read me some Morton! hey Liviu, my friend in Australia got this for me and it just showed up in the mail...has the UK cover, 600 page doorstopper. I need to get on this one! Sorry I cannot agree with you about this book. There are just too many glaring holes. Jimmy is supposed to be loyal honest and true. Those are the things everyone loves about him. Do you not think it odd that during his stint in prison and then afterwards when he was sent to war he did not write to "Dolly". He knew she was going to take the job at the sea-side. He didn't know she was dead. It seems so very out of character for him not to try and find her when he got back from the war. Also. Henry would surely have known his wife's body.. even if her face was crushed.. and her clothes etc. he would have realised it wasn't Vivien. He would also have known that Jimmy was still alive and would have pursued him when he got back from the war. Whilst the book was ok, there are just too many things that just would not have happened. Excuse me? She killed him in one fell swoop with a CAKE knife? Cake knives are not sharp. And who writes direct quotes in a journal entry as we are to believe Kitty did? And Jimmy, are we to believe there was a glorious love between him and Dolly? Half the time Dolly was embarrassed by his common ways. ??? Clunky! I loved this book and read it in one day. Aliens could have landed in my room and I would not have noticed. All the queries have been answered for me except one. When Henry is aware that Vivien has left everything to Jimmy's Dad why did he not contest the will? He was her next of kin and Jimmy's dad had not money to fight the ruling in court. When he was aware that Jimmy returned from the war why did he not have him killed then. I was just curious why, when Laurel was researching Henry Jenkins and saw Henry and Vivien's wedding picture, she did not recognize Vivien as her own mother? I was wondering the exact same thing! I think they mentioned something about a veil but a daughter would recognize her mother. At least they should have emphazised more how much alike they looked. Personally I liked the book although the start was a little slow for my taste and I greatly disliked Dolly. Why did Henry say, "Hello Dorothy." When he knew she was Vivien? On the wedding picture, I'm pretty sure she had her veil over her face in the picture.